Being a special education teacher can feel isolating, but there are some ways to build connections with colleagues. Alone, isolated, left out: This is the way most special needs students feel in school. But what about special education teachers—do they feel equally isolated? Quite often, yes. I taught special education for 30 years, and at times it was difficult for me to feel accepted as part of the teacher team when my role in the classroom was so different from my colleagues’. This is the reality for many special education teachers. 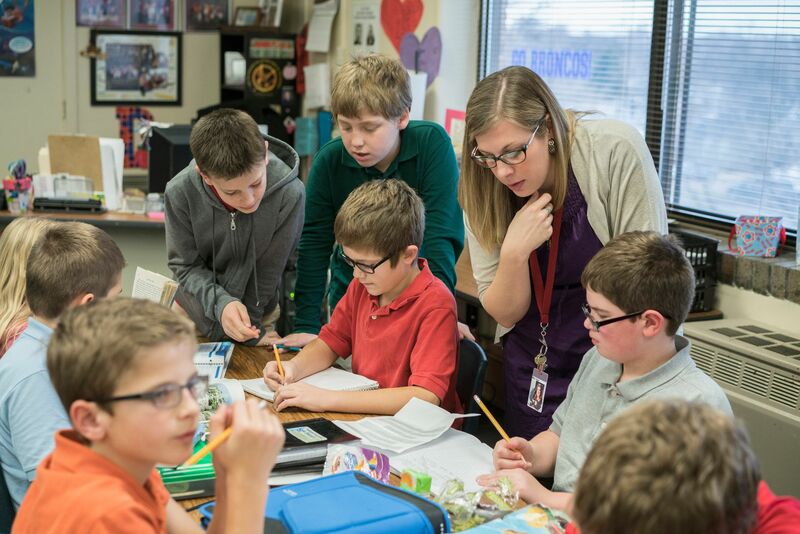 Most work with a small group of students, concentrating on specific learning goals determined by their students’ IEPs (individualized education programs). Special education teachers implement teaching strategies to meet the many differentiated objectives their students have. In many instances, the special education teacher is focused on social and emotional skills, as opposed to more academic skills. The special educator’s colleagues, peers, and even administrators often perceive this difference as meaning the special educator has an easier job. The idea that every student has his or her own diverse needs and requires specialized learning is one that not all teachers find easy to comprehend, let alone implement. Special needs students require personalized attention in order to learn and thrive. Conveying this idea was often the biggest challenge for me as a special education teacher. I regularly felt that I had to go to battle with my school leadership to get what my students truly needed. It was as if our concerns and advocacy for our students were viewed more as nuisances than as ensuring we met our students’ right to a fair and equitable education under the Individuals with Disabilities Education Act—commonly called the IDEA law. I love an idea expressed by Melvin Konner: “In order to be treated fairly and equally, children have to be treated differently.” This quote helped me get through many circumstances in which I felt misunderstood by the school system. The idea that children must be treated differently was fundamental to my core values as a teacher. For example, some children are unable to sit at their desks for any length of time and are better off standing up to do their classwork. Accommodations like this should be acceptable, but often they’re not. Adding to all of this, special education teachers frequently work alone, in isolation from their general education peers, who may have team meetings once a week instead of once a month. In an inclusion setting, special education teachers can be treated like outsiders and made to feel like instructional assistants in the class. Even the students question whether you’re a “real teacher,” and this can be damaging to even the strongest special education teacher’s self-worth. The special education teacher must communicate with each student's parents, other classroom teachers, and therapists, as well any special area teachers that work with that child on the particulars on their IEP. This can be very challenging, especially when you try to be sensitive to all parties involved—and finding time for all this within the school day is nearly impossible. In the beginning of a school year, ask the general education teacher when it would be convenient to share and explain what each student’s IEP is all about. This sharing of the document is a requirement and must be done early in the school year. Set up a short meeting and make a simple cover sheet that’s easy to understand—you can easily find free sample cover sheets online. Breaking down an IEP into layman’s terms is not an easy task, and the discipline-specific terminology is another factor that isolates special education teachers. Stanine scores, visual-motor integration, functional behavior plan, auditory processing deficits—it’s a lot to take in. What’s most important is ensuring that the general education teacher understands how to best work with each special education student to help them reach their full potential. Use the IEP as a living document and guide to the delivery of instruction. As much as collaboration between teachers is encouraged, it remains complicated. If all teachers could learn to support each other, work together, and make compromises for the attainment of student goals and objectives, it would make teaching more productive and rewarding for all, particularly for the special education teacher. Substantial progress has been made in recent years to be more inclusive, and team-teaching is becoming more commonplace. Cultivating trust with the other professionals and working collectively can help build stronger teacher communities. Volunteering to be a mentor to a new teacher or offering to help implement an instructional coaching program can break down barriers. Growing your professional learning network is easier now as social platforms help teachers connect and be part of a global community. These factors can go a long way toward alleviating feelings of professional isolation.